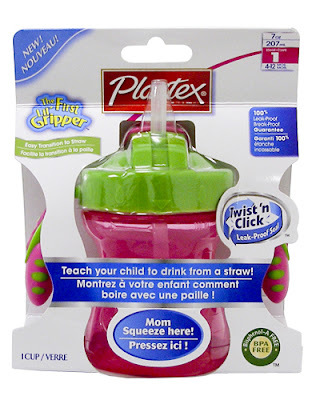 I received a First Lil' Gripper Straw Trainer Cup from Platex in order to try it out and review. All of our cups tend to be Playtex brand at this point... although I have tried just about every brand under the sun in the past 6 years. This cup seemed to have all of the normal things we like about Playtex cups and more. I always like the "Twist 'n Click" closing so you know the top in completely on. A sippy cup is useless if it's not spill-proof (and this one says "Spill-Proof, Leak-Proof, Break-Proof Guarantee"). This cup has a new feature that let's you squeeze to make the drink start up the straw to encourage your child to try drinking. Ana and Zoe are both WAY beyond the suggested age for this cup (4 months - 1 year) so we enlisted the help of our 1 year old friend Julia. We've used it a few times now. It seems relatively simple to clean - the top part fits easily into the little "cages" I have for cup parts. I washed the straw separately by hand, for fear that it would get lost in the dishwasher. It assembled easily - the straw clicks into the top part, and it didn't require super-human strength to twist to the marked area. It's advertised that the parent can squeeze the cup and the liquid will go up, teaching the baby that liquid comes from there. I was able to get it to do that a few times, but not consistently. I couldn't figure out if the twist pressure inside needed to be more or less, and it wasn't in the instructions. It was cool when it worked, though! - Stands up to normal toddler use (including banging!). - Guarantee - if you're not fully satisfied... you can return for full-purchase price or a similar product. - Lots of places to purchase (Target, Walmart, Babies R Us, and online at the Playtex store). - It does have parts... some people don't like having separate pieces to clean. - Squeezing feature really isn't consistent and no directions on how to get it to work properly. You can find Playtex Baby on Twitter and on Facebook.